Dark times demand dark games, and it doesn't get much darker than the horror oeuvre of H.P. Lovecraft. Not to be confused with the maker of fine brown sauces, Lovecraft specialised in a particularly bleak and terrifying brand of cosmic horror in which the universe is ruled by beings older and more terrible than the human mind can comprehend. He was also big on tentacles and fine early 20th century suits (although to be fair that was more a function of the period he was writing in than personal taste). It's worth noting that Call of Cthulu isn't the only Lovecraftian game to land on games machines in 2018/19 but it's arguably the one with the strongest pedigree, spinning off as it does from Chaosium's tabletop RPG of the same name. You play as private investigator Edward Pierce, called to investigate the tragic death of the Hawkins family on the isolated Darkwater Island off the coast of Boston. Dubious police reports and dodgy locals about and it becomes clear that something is decidedly off. It doesn't take long for Pierce to descend into a dark world of cultists, conspiracies and cosmic horrors that shake his very sanity. 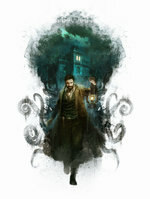 Fisticuffs and guns won't be much use against this kind of terror and Call of Cthulu is built around investigation. Speak to island inhabitants, uncover cryptic clues and develop Pierce's skills as you get closer to the awful truth. It won't be easy, though - anyone who's read Lovecraft will know that madness awaits you, and you'll need to walk the razor-thin line between reality and insanity if you want to keep your senses reliable and unravel the mysteries of Darkwater Island.